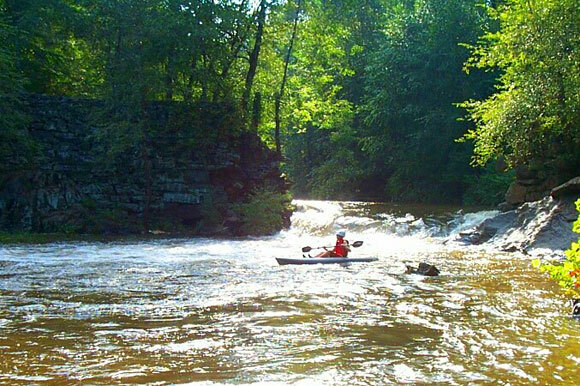 Historic Banning Mills offers exciting kayaking adventures! Enjoy a peaceful trip in our unsinkable kayaks. Our kayaks are safer than a boat or canoe, are hard to turn over, and no roll training is required. These kayaks provide a relaxing platform to observe nature’s wonders and the native heritage of our rivers and creek. 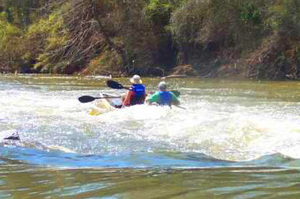 Enjoy kayaking in the Chattahoochee River or in our lake. Go back in time and paddle in the same areas as the Creek and Cherokee Indians did generations ago. We offer a 7-mile kayak trip (3-4 hours), or a 12-mile kayak trip (5-6 hours). The 7-mile kayak trip on the scenic Chattahoochee River includes seeing the historic Chief William McIntosh Reserve. Price: $85 per person for the seven-mile trek. $120 per person for an exciting 14-mile trek. Note: If you would like a picnic style lunch to take with you, we can prepare that IF we know ahead of time. Let us know BEFORE you go out on the trek. Price: $26.00 for two guests. Please Note: Group size is a minimum of 2 guests for the 7 miles. We must have at least 4 guests to go out on the 12-mile trek. Participants must be at least 10years old to go out on a single kayak. We will allow 5-year-olds and up to go out with an adult tandem. All guests must weight less than 285 pounds. Shoes or Water Shoes are required and all participants will be required to wear life jackets the whole trip. You will get wet so it is best to wear a bathing suit with shorts or jeans. Sunscreen, insect repellent and a hat are a good thing to bring with you, as well as a beach towel to dry off. There are no convenient stores on the river, so plan to bring water or snacks for your trip in a waterproof baggie or container. Need a little more extreme? Try our White Water Day Trip with pickup time at 8:30 am. Sites can be either at Columbus or North Ga. The location will be up to Guides due to water levels and safety issues Must be 12 years old to do this trek. Guests will experience Class 2 to 3 rapids. Price includes transportation to and from, basic instruction, guide on the river while on the trek and a picnic style lunch. Must wear water type shoes. Bring sunscreen and insect repellant. $215.00 pp and includes the lunch and transportation Note: Minimum of two to open the adventure trek. Estimated time gone: 5 to 6 hours. Things to know to plan your trip. Trips are available all year long, except we are closed on Thanksgiving Day and December 22 through January 2 each year. We reserve the right to cancel trips due to inclement weather and to substitute treks due to water levels. A designated adult must accompany minors. Kayaking does require advance notice. Bring water and snacks especially for the longer treks. Have in some type of waterproof container. Wear some type of water or tennis shoe. Wear sunscreen and bring some too! We encourage you to wear a hat. Insect repellant is helpful. Come ready to have fun!! A 7-day cancellation notice, before the reserved trip date, is required. If the cancellation is less than 7 days before the event, 50% of the total charge will be assessed to the credit card on file. No shows or cancellations on the day of the event will result in the full amount being charged. PLEASE NOTE: All water adventures are by phone reservations only. Please call 770-834-9149 for availability and bookings.